With Microsoft Office 2010, you can upload any document to your Windows Live SkyDrive account right from the Office program and access these files from any other computer. 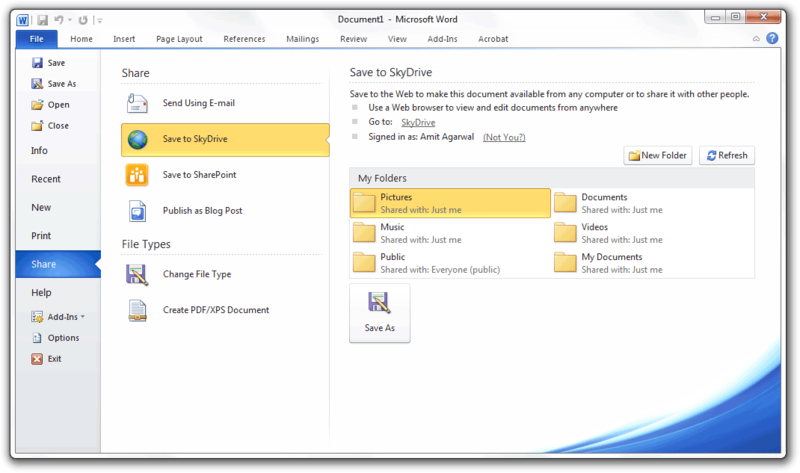 To save a document from Office into SkyDrive, go to File -> Share -> Save to SkyDrive. The SkyDrive facility is available in Microsoft Word 2010, Excel 2010 and PowerPoint 2010. Going forward, you’ll also be able send Microsoft OneNote 2010 notebooks to your SkyDrive account but that feature is not live in the current build of Microsoft Office 2010. Other than SkyDrive, you may also use the good-old Office Live add-on to save documents to your Office Live Workspaces account.